The image above comes from a recent Wall Street Journal story “Hospital hit as Fighting Engulfs Syria’s Second Largest City.” The Journal claimed that “Dozens of civilians were dead” following air strikes it attributed to Russia and Syria. Two critical factors emerge here: first these claims are being relayed by the Syrian Observatory for Human Rights, a one man operation run from Coventry England, which has suspected links with Western intelligence. Perhaps more tellingly though the photos carried by the WSJ in its article are strangely similar to earlier photos of Israeli air strikes on Damascus and Beirut They are even more reminiscent of photos taken of the destruction wrought during the Israeli offensive in Gaza in August 2014. Is that where these photos were really taken? Are these stories about Russian/Syrian airstrikes yet more disinformation carried by the Western media? Ed. Overnight Wednesday, US-backed terrorists shelled Aleppo’s Doctors Without Borders (MSF) al-Razi hospital and nearby residential areas – killing at least 20, injuring dozens, some critically. Syrian media reported rocket shells “stuffed with highly explosive materials” caused extensive damage. A Syrian military source said falsified reports blamed its warplanes and Russia’s for the attacks. US-backed terrorists bore full responsibility. Three children and six medical staff were among the casualties. The ICRC said escalated fighting worsened the humanitarian situation for tens of thousands of area residents. 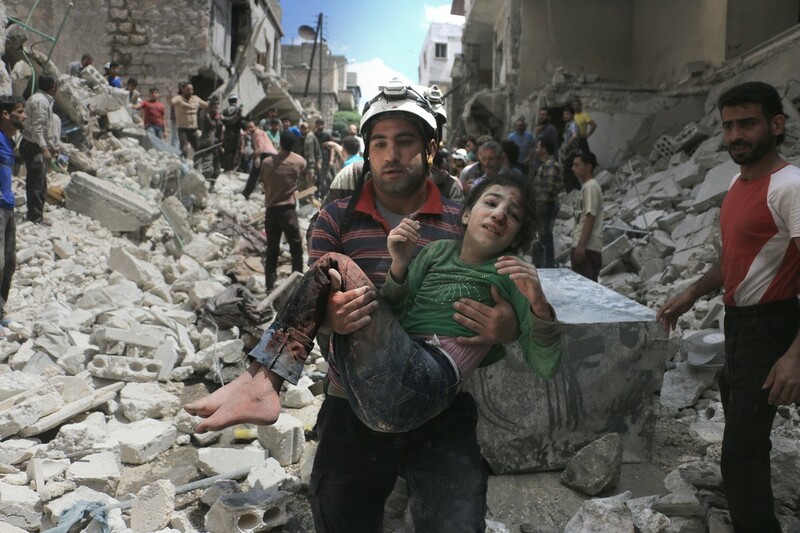 Other Aleppo area terrorist attacks in the last 24 hours killed at least 49 civilians. Cessation of hostilities is more myth than reality. No matter what efforts are made to revive peace talks, they’re effectively dead going nowhere. Pro-Western mediator Staffan de Mistura wants another round begun on May 10. He urged Russia and America to try “revitali(ing) what they have created and which is still alive but barely.” Both sides are intractably apart. No responsible government would agree to unacceptable US/Saudi-backed opposition demands. Obama wants war, not peace, deploying hundreds of special forces to northern Syria illegally on the phony pretext of combatting ISIS. US warplanes continue attacking infrastructure and government sites – along with recruiting terrorist fighters and arming them. Their scourge is one of humanity’s greatest threats. They thrive because of foreign support – from America its creator and rogue allies. They can’t survive without it – reality media scoundrels suppress, maintaining the fiction of US-led efforts to combat it.